order and welcomed everyone to our final meeting for the year. followed by 14 months in England - he is slowly moving towards home. now decided to become a member of the club. motion was carried by acclamation. Melbourne during October and saw Graham and Tony briefly. Graham Jost provided a brief report on our October Exhibition - a more detailed account was presented in the last newsletter. He also asked the meeting if we should hold an exhibition next year (2001). A motion to this effect was proposed by Jack Parsisson, seconded Barry McDonald and was carried unanimously. Please note that the Club will be calling for nominations for the committee to run our 2001 exhibition at our next meeting. So if you are interested, please give it some consideration. Mind you, it is going to be a hard act to follow. The new format of the MMC Newsletter (in "hard copy" as posted to members) seems to have met with general approval. But with the new layout we have at least 4 pages of text to fill up - the meeting report will normally occupy only part of this space, so there will be room for additional articles. So, what about some written contributions? Another point is photographs. I still have some pictures that I took at our October Exhibition that can be used but we are going to need a continuing flow if this feature is to be continued. demonstration of models and general discussion about modelling. This will be a permanent feature of future meetings. winding of the motor to power it. Pictured at right is Wes' Christmas tree. bevel gear but none of these seemed to have my name on them. Graham also demonstrated his model of Konkoly's Climbing Monkey on a String in bright, shiny refurbished Meccano. All in all a very pleasing model with a most ingenious mechanism. 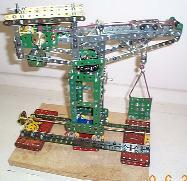 Barry McDonald had an example of a mechanism where Meccano is put to a practical use. It was a head for a tripod for mounting a camera which enabled the camera to be moved backwards and forwards. Barry uses it for taking close-up pictures of wildflowers. In use the lens is focused at infinity, the camera is set up on the tripod at about the correct distance and then the mechanism is used to move the camera backwards and forwards until the subject is in focus. A very neat mechanism, and particularly well designed since the backlash is practically non existent. Somerville) for simulating the action of a hydraulic ram in Meccano. the International Meccanoman and on at least one web page. The motors can be obtained from England but are not particularly cheap. Or, they can be bought locally from the Australian Agents "Erni" at an even greater cost. Another mechanism shown by Graham was a very useful strip bender. This device is almost essential for putting even and accurate curves in strips when required in modelling. It can also be used to straighten bent strips by curving one way and then the other. would have been proud of you Kimball. On the subject of Meccano parts, Kimball has found a source of hard bright steel rod in 30" lengths. It is 5/32" in diameter which is a little smaller than Meccano axle rod. No price is available yet. Models were exhibited by the following Members. 1950's; Display Case Outfit No 3, 1960.
bank); Motor Bikes; The Barge. Jack Parsisson: Rolls Royce Car 1901; Fowler Plough Tractor. exhibited models at the World Vision Centre Expo. bSpecial thanks are extended to Peter During for entertaining the children at the Expo over the two days. by Bill Fitzgerald, newsletter editor. Our first meeting for the year 2001 (the real millennium?) was held at Jack and Carol Parsisson's on Saturday afternoon 10 Feb 2001. A very pleasant mild and sunny summer's afternoon brought out our members in force with some 37 attending. Rupert Alexander from Mornington. Rupert's interest in Meccano goes back many years - he first joined the Meccano Guild in 1965.
tables in the main foyer in a pleasant air-conditioned environment. The following Members displayed their Models at the Swapmeet. John Brand. Display Case with No 3 Set. New model, Seaplane (No 5 R/G). plus 3 other No 5 models, Truck, Tank and Crane. Graham Jost. 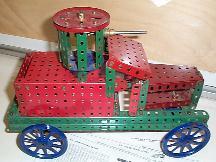 Ballroller, Traction Engine, Meccano Band, Konkoly's Climber. Dave Denner. 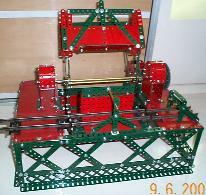 Block setter Crane . Front-end Loader, Grandprix Racer. Roger Hall. Station truck, Motor Scooter, Tricycle, Motor Bikes, 2 Walking Bug Models. Kimball Monger. Motor Cycle Whimsey, Vintage Speedway Sidecar, Kitty Howard Paddle Steamer, plus various hands on movements. Jack Parsisson. 1901 Rolls Royce, Fowler Plough Tractor. A special thanks is extended to those Members who helped to make it a successful Exhibition of Meccano Models by displaying their Models. Wes Dalefield started things off by demonstrating his plate roller which uses 3 silver steel rollers each 3/8" diameter, turned down to Meccano axle size at either end but otherwise is constructed of conventional parts. His contribution to the models was a remote control car, built at the request of his 6-year-old son. The boy had been pestering Dad to build him a model - didn't buy the idea that it was a grown-ups' toy. Happily he was very pleased with the result. See photograph at right, below. Peter During showed us his Motorised Racing Car and Weighing Scales built from Motion Systems 2 and 1 respectively. As well, Peter had built a small reversing mechanism using (what some might call) more conventional Meccano. would not stoop to that? Description of prototype at right. 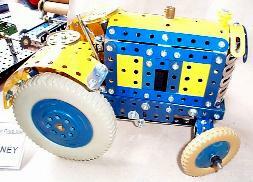 Mike Maloney produced a nice clockwork powered tractor in dark blue and yellow (built from a description in the July 1992 edition of Newsmag). Photograph at right. Lindsay Carroll has been busy with another model - a Skip Truck with hydraulic operation simulated by cord. The model is still under construction and Lindsay provided an entertaining commentary about some of the constructional difficulties. It is to be finished in time to go on show at the Steamfest exhibition. Graham Jost showed us his "push me - pull you" model" (see photograph). I'm not sure what the point of it is, but it was nicely made and interesting to watch. Photograph at right, below. Kimball Monger and Dave Denner have been demonstrating mechanical principles to primary schoolchildren - using Meccano of course. Kimball had several "hands on" demonstration models mounted on a board. These comprised a range of belt, chain and geared drives including an epicyclic drive. After the children had worked these, Dave showed them some of the principles at work on his Block Setting Crane. each group) stayed back (when they could have been out playing) to find out more about what they had seen. Their questions were perceptive and demonstrated a general high level of understanding. Mike Mason had a model of a Straddle Truck - one from the 1970's No 9 yellow/zinc manual. 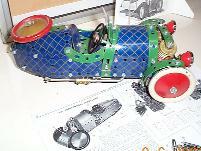 Dave Denner's contribution was a Dragster Racer from the Motion System 7 Model Set. Graham Jost was interviewed recently on Radio 3AK about Meccano (what else?). Quite a long interview (which I did not hear) but unfortunately no response regarding potential MMC membership. Apparently no one listens to 3AK. Vern Ellis is soon to be interviewed (end February) on Bacchus Marsh Radio (Big Apple Radio 98.2 FM). The interviewer has already been to see Vern's Meccano collection and was quite amazed that one person could have so much Meccano. precise details of the subject but it sounded fascinating. For those interested in statistics, there have been over 1000 visits to the page, 45% from Australia; 15%, USA; 7%, NZ; 6%, Netherlands; 5%, rest of Europe; 4%, rest of world; 18%, unidentified. Roland Jaggard who provided many beautiful photos of immaculate strung sets. This is a site not to be missed and is highly recommended. 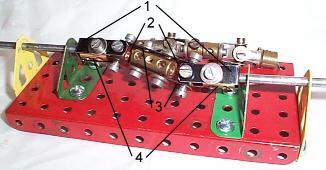 providing links to over 40 Meccano sites. 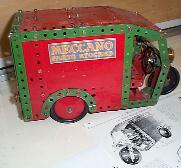 For those who want to discuss Meccano there is the Spanner Group which has been set up by Paul Dale (Queensland). Do not include a subject or anything else. If all goes well you will get a message asking to confirm your Spanner subscription. From then on you will receive all of the messages that other Spanners send to the group - up to 50 a day. Some are very interesting, others would be better not sent (in my view). Jim Osborne would like to fit a bell to his Sydney Tram but is having trouble coming up with a satisfactory solution. Anyone with any ideas can contact Jim direct (03 9596 4426) and/or talk about the issues at our next meeting. A Vertical-Boilered Steam Road Roller. A striking feature of this machine is the tapered upper third of the boiler which makes it wider at the top than the bottom. This was an uncommon shape, and would be troublesome to model in Meccano. 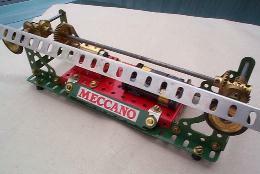 This Meccano Model is based on one used by the Barber Asphalt Paving Co. of Pennsylvania, USA. The proper name for any machine with two broad rollers is a �tandem roller�, but because of the vertical boiler these are known as �coffee pots�! The position of the driver unenviable. He is seated over the steered roller, which is regarded as the front. To drive in that direction he would have had to turn in his seat and turn his head as well. In the other direction he would have to lean out to see around the boiler, or crane his neck to see over it, hoping no ash would get in his eyes. Our second meeting for the year was held at the Bri Phil Hall, Elsternwick on Sunday 8 April 2001. We had a typical Melbourne day (warm and windy in the morning - cold and wet by the time the meeting started) but nevertheless 29 members came along. Informal proceedings began at 1 pm with a display of models, general chit chat and of course the always popular sales tables. Our President Tony Press began the formal meeting at 2 pm and welcomed all to our 90th meeting. (Digital images at right by Jack Parsisson). Tony Van Wageningem (who found us on the Internet via our homepage), Jack Little (who later spoke on Australian copies of Meccano) and Dave and Sandy Feinstein from the JMH (Johannesburg Meccano Hobbyists). Dave is the Chairman of the JMH and they are passing through Melbourne on their way to the Meccano Centenary Exhibition in New Zealand. Speakers at future meetings. Jack Parsisson has volunteered to give us a chat about manufacture of Meccano replica parts. This will be something to look forward to, particularly given Jack's skill in this enterprise and the wide range of parts he produces. While on the subject, your Committee needs more volunteers for future talks. 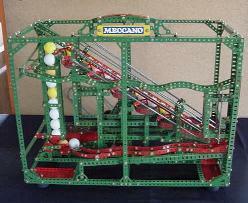 Anything Meccano related would be appropriate, so if you have any ideas please make them known to a committee member. Kimball Monger. He has obtained (free) a 60m length of grey gabardine cloth which Carol Parsisson has very kindly offered to cut up and overlock. The cloth is compliments of Bruck Textiles of Wangaratta and the MMC Inc gratefully acknowledges their generosity. A dark background is particularly effective for showing off Meccano models - our October exhibition should be really something. Passing of Walter Ashburn. It is with much sadness that I have to record that Walter passed away on 7 March this year. The Club has sent a condolence card to his widow Peg and son John. As many of you will know Walter's health had been deteriorating for some time. Walter had been a major contributor to the Club especially with the range of well made replica parts he supplied. Always cheerful and ever the optimist he always seemed to have plans for the production of additional replica parts. New Range of Meccano. As part of his business Paul Johnstone recently attended the Toy and Hobby Fair in Melbourne and visited the Toy Traders (Meccano Importers) stand. (Well I know it's a chore but I suppose someone has to do it Paul. -ed.) Their 2001 range has a variety of new sets. But Toy Traders are not interested in any involvement with the MMC. They would want us to work through a retailer. This is not a happy approach. Meccano String. Graham Jost reported that sales of the red cord have been an outstanding success. He had just one 10m length left - this was immediately snapped up at the meeting so the cord is now all gone. Overall, the Club funds have benefited by over $80 from this enterprise which you may recall was set up by Jim Osborne. Well done Jim. Several Members exhibited their models at the Scoresby Steamfest held over the March long weekend. Jack Parsisson's report is presented with some pictures of the models on the photos sheet. Future Exhibitions. In fact there is nothing on the books until our own in October. So if you have any suggestions of suitable functions (model railway exhibitions, toy swap meets etc.) to which we could be invited please let Jack Parsisson know. Graham Jost demonstrated his Ping-Pong Ball Roller beautifully finished using re-furbished Meccano parts and gleaming newly brassed nuts and bolts. It certainly lived up to its reputation as a reliable performer and is a very neat model. It seems that Graham started construction about half an hour after his CQ arrived. He even had to warn off at least one member from building the model straightaway, asserting that he had a prior claim. Wes Dalefield's models (see photos) have once again drawn on inspiration from his sons. No 1 son wanted a Meccano spider to show the boys at school. The result based on the Meccanoid models of the late 70's is very attractive and it moves quite realistically. More importantly it was a real hit at school. Wes's second model was a mammoth constructed from his younger son's No 40 set. But the gearing was unsatisfactory and had to be slowed down using a MW special 6:1 reduction gear pair. 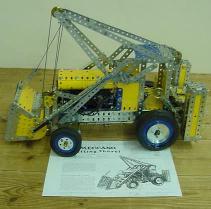 John Riley produced another No 10 model in yellow/zinc, the Meccano Lifting Shovel (see photo). 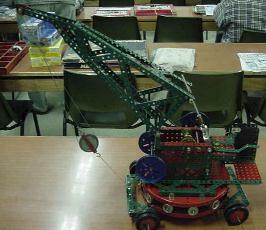 Typically, there were several faults with the model as described, in particular the mechanism for lifting the shovel. 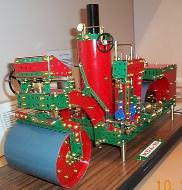 Roger Hall's contribution was two small but ingenious models, a steam wagon and a drill press, both constructed from immaculate refurbished parts. Tony Press had a model ambulance made from Dinky Builder parts as well as an unused and still strung No 2 Dinky Builder Set. Alan Lomax showed us his version of the Joseph Manduca model of the "disappear-ing guns"(see photo). This model is based on the WW2 guns at Gibraltar. 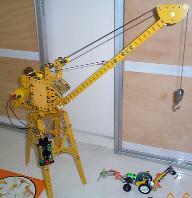 Ron Bassee brought along two models based on pre-war instruction manuals, a mobile crane (see photo) and a hydraulic crane. Finally Mike Maloney demonstrated his Robot constructed using the contents of the Centenary Meccano set. Dave Feinstein from the JMH began by reading a message of goodwill to our Club in this the centennial year of Meccano from the Chairman of the ISM. He then went on to present a brief history of the JMH. Of particular interest was their drive to encourage junior members when they found club membership was flagging. This has proved very successful with seniors working with the juniors to help them develop their modelling skills and to maintain their interest in Meccano. 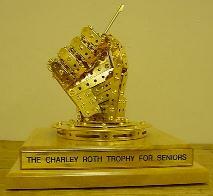 Finally he described the development of the idea of the Charley Roth Memorial Trophy for senior modellers. Charley Roth was a prolific South African Meccano modeller who specialised in very large models which were finished with meticulous attention to detail. After Charley's death a competition was run to select a design for the trophy. If you don't have the internet at home but live in Victoria, remember that you can get free access at your local library. We were very pleased to welcome Dave and Sandy and are especially appreciative that they were able to stop over in Melbourne and come to our meeting. Jack Little was our second speaker and gave us an account of copies of Meccano manufactured in Australia. The most recent count is 13 copies but this number may well increase as more are unearthed. The story began in Melbourne in 1922 with an application for patent on a new system to hold together Meccano-like parts. It used slotted pins (instead of bolts) and wedges (instead of nuts) inserted in the slots. The first sets (Nos 1-3) were made by Ezy-Bilt in 1936. Interestingly for a Melbourne product the box had a picture of the Sydney Harbour Bridge rather than some Victorian icon. Manufacturing ceased in 1941 (although a war kit was produced that year) and began again under Govt. permit in 1944. Jack talked about some of the other copies - most of these never re-started after wartime restrictions stopped their production in 1941. Thank you for an entertaining, informative and interesting account Jack. My only question is - are you going to write all of this down and publish it in some form? Having it put up on the MMC Web Page might be a start. The third meeting for 2001 of the MMC Inc was held at the Bri Phil Hall, Elsternwick on Saturday 9 June. The doors were opened at 1 pm and for a while it looked as if the overall turnout would be rather modest but by the time the meeting began numbers had swelled considerably to 37 members and wives as well as 3 visitors. Holding the meeting on a long weekend was not such a bad idea after all. A further pleasing feature as well as the good attendance was the number of models that had been brought along. There was plenty to look at and talk about during the first hour of informal proceedings including the usual lively sales tables. At 2 pm Tony Press our President called the meeting to order and welcomed everyone to our 91st meeting. First of all Tony introduced a new member Tony Van Wageningem (who was a visitor at our April meeting) and three visitors. Bruce Beattie had Meccano as a boy, then following a break of 30 years his interest was re-kindled with the purchase of a No 2 Clock Kit. Chris Comer found us via our Web page and was surprised to find during his surfing just how much Meccano is on the Web, but alas, few dealers. Peter Holles brought along a model of an articulated truck which he had built for his son about 15 years ago. Clearly it had a profound effect as his boy is now a diesel mechanic and drives B doubles. Speakers at future meetings. 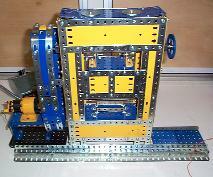 Graham Jost has offered to give a talk at the next meeting on constructing Meccano models. This is intended to be an introduction to the subject with some general ideas on how to get started, particularly those new to Meccano or who have been away from it for some time. As most of you already know Graham is one of our better modellers and has a flair for producing interesting effects. Later on it is proposed to have a presentation on collecting Meccano. 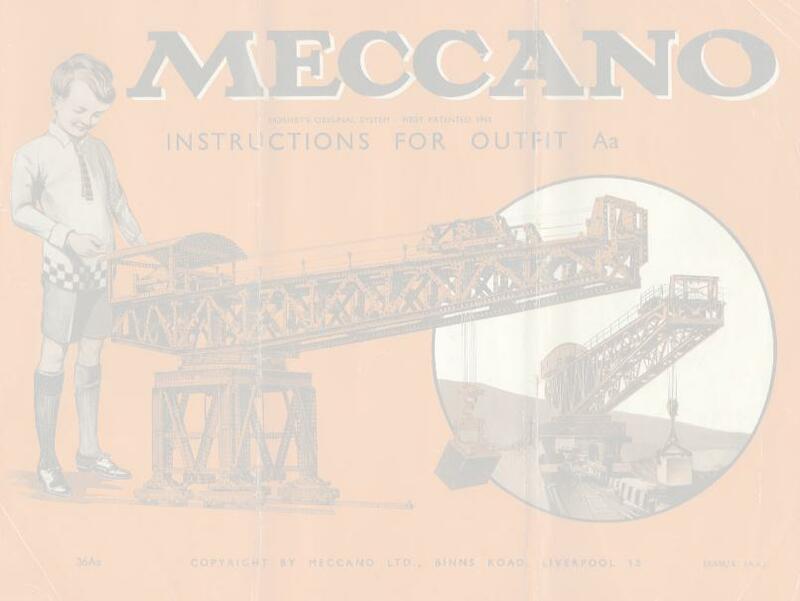 This will cover suggestions on where to find Meccano as well as information about some of the more unusual Meccano parts/sets/literature etc that turn up from time to time (usually at a rather high price for most of us). But more volunteers and/or topics are needed. Please contact a committee member if you have an idea. Club Logo. After a year of general inactivity some limited progress has been made. Our President produced a suggestion at the meeting but this has not met with unanimous approval. This matter will be discussed further at our AGM. Display Cabinet. We express or thanks to Graham Jost who was able to obtain an attractive one for the Club at a recent auction. This will provide a secure location for displaying valuable items at meetings and more particularly at exhibitions. So you can now get that rare Meccano out of the bank vault or safe and bring it along to be admired in complete safety. Exhibiting Opportunities. The Secretary has received a letter from the National Trust of Victoria asking if the Club might like to participate in a NT exhibition at the Maritime Museum on Sunday 7 October (a week before our own exhibition). They are looking for steam and or machinery models but nothing is finalised yet. Contact Jack Parsisson for more information. A second opportunity (definite) is the Model Train Expo & Hobby Show to be held at the World Vision Centre (Burwood East) on 17 and 18 November (see Diary). Jack Parsisson has produced some eye-catching posters printed on bright yellow paper for advertising the event. Two types are available - a large print style in horizontal format for placing in your car window and a more detailed vertical poster for putting up in shop windows, local library etc. Special thanks to all who have already collected posters. They will be available again at our AGM. Planning of this year's MMC Exhibition is again in the hands of Exhibition Committee. Minutes of the meetings held so far are available from Graham Jost for anyone interested. Bruce Douglas will be putting on another (different from last year) display of Meccano Literature. It will be worth coming along just to see this. Volunteers are needed for door duty. We will have two people at a time on duty for one-hour spells. So with the earlier start time we will need lots of people. Please contact Jack Parsisson on 03 9789 5796 if you can help. This year we will be hiring trestle tables for use in the Alfred Neufeld Hall. These will be of uniform size and when covered with our new black tablecloths (thanks again to Kimball Monger for obtaining the cloth and to Carol Parsisson for cutting and overlocking). They will provide an impressive background. All that is needed are YOUR models. We are going to be more professional this time and each visitor will be provided with a catalogue for the Exhibition. We won't be organised enough to have a list of actual models (going on past experience) but the catalogue will include the name of exhibitors and the general types of models on show. A show of hands at the meeting suggests that at least 20 members intend to exhibit. But please remember that small models are very appropriate. These are also very interesting, especially if they are of the "hands-on" variety. The message from the Exhibition Committee is "please contribute". As many exhibitors as possible are wanted and all contributions are welcome. As an incentive all exhibitors will be admitted free but for other members the fee will be $2. Also the Exhibition Committee is looking at the possibility of an award for first time exhibitors. A final point is that exhibitors are encouraged to provide a little written background information about their model. This would be of considerable help to our visitors. 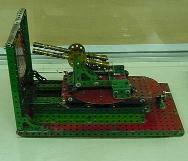 Graham Jost provided a brief report on his visit to the Centenary Meccano Exhibition held at Upper Hutt at Eastertime. Jack and Carol Parsisson and Bruce and Fran Douglas also attended. Day 1 was for set-up, day 2 was for exhibitors only and on day 3 the exhibition was open to the public. There were about 50 exhibitors, nearly all from the North Island. Graham also brought along a good selection of fine photographs for us to admire. Graham Jost led off with two examples of small "hands-on" models. The first was a windmill that always rotates the same way regardless of which way the crank handle is turned (why is it so?). As well he had a merry-go-round - it would only go around if the handle were turned clockwise (otherwise the children would fall off the horses). This was based on a model at the NZ exhibition. Paul Johnstone showed us his try at building the Goods Warehouse SM 31 (see photo). It looked very handsome built with Jack Parsission's (red green) replica parts but Paul was frustrated with much of the construction. The intricate safety devices for the lifts constantly fouled and had to be removed and the E15R electric motor does not really have enough power to drive the lifts. Do not assume that building a model from a plan will be straightforward - such models rarely perform as described. Getting these models to work properly may require more skill and ingenuity than building a freelance model. 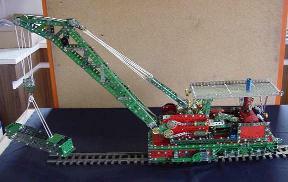 Peter During had two models, a Power Press and an Electric Locomotive running on Meccano track (see photo). Peter's models are always interesting and are good examples of what can be achieved from relatively minor variations to instructions in manuals for sets. Tony Press's models were also variations from instruction manuals. His modifications to the Three Wheel Car, Motor Tricycle Delivery Van (see photos)(both from a 1940's No 4 Set) and the pre-war Gun Carriage. It showed what can be done with the addition of some extra parts. Very nice Tony, but I'm not sure how many of us have parts from the pre-war Meccano Lighting Set to dress up models (count me out [ed.]). Peter Holles as already mentioned had his articulated truck, sadly somewhat "ratted" over the years by his sons who found odd pieces of Meccano very useful for making brackets etc. Barry McDonald had his Crash Tender from the No 5 Evolution Set, redesigned as a "push-along" model. Barry found the motor was inadequate for the model. Roger Hall produced 4 models from the recent single model sets all with lots of iridescent plastic parts. On a more sober note (for me at any rate) he also had a nice model of a level-luffing crane (see photo) from the 1970's crane outfit. 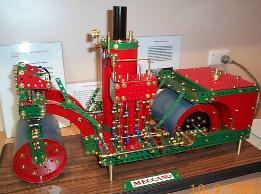 Mike Malony's contribution was a Beam Engine as described in the Meccanoman's Newsmag (see photo). Were there any genuine Meccano parts in the model Mike? Kimball Monger's model of the Hand Barrow from the 0 Outfit Manual (using the actual parts in the set he received for his 5th birthday) must be about as simple as you can get. But it is very appropriate. His other model (see photo), the Chris Warrell Blocksetter (Hammerhead according to Kimball) was a little more advanced. But again it was a simple "hands-on" model with several ingenious innovations. Ron Bassee showed us his model of a railway wagon coal tipper (see photo). Tony Van Wageningem (our newest member) demonstrated what can be done with just a few dollars worth of cheap 2nd hand Meccano with his Water Powered Drilling Machine. To wrap up the formal proceedings of the meeting Jack Parsission gave us an entertaining account of his "Binns Rd South" enterprise. Perforated strips should be quite simple but Jack found immediately that Meccano Ltd used a wide range of gauges of steel, (varying by up to 0.020" for strips of similar length) and that often the holes were not well centred. For angle girders a softer and more malleable steel alloy known as "forming steel" needs to be used. This is used for the casing of household "white goods". Attempts to economise using offcuts from flashings etc. (Jack is a plumber) proved unsuccessful as the alloy is too hard to allow tight bends. Jack also produces a range of other parts - flat plates, flexible plates and circular parts in particular. The latter includes some non standard parts such as a range of annuli for making flanged wheels from circular girders, large flanged rings etc. As well he is now producing an assembly for use as a hub for ash tray tyres. Jack's large flanged rings passed the ultimate test recently in NZ where the Kiwis after a � hour of close examination pronounced them "OK". This is praise indeed Jack. Two new lines of Jack's are 1" x 1" and 1" x �" angle girders available in lengths from 1�" to 24�". Check his latest price list on the link on the home page of this website! With genuine Meccano becoming harder and harder to obtain, modelers are increasingly resorting to the use of replica parts. However, not all parts can be acquired in this way and Patrick Russell-Young has come up with his version of a universal joint. An illustration of his idea is shown in the photograph at right, which is of an offset parallel drive. The mechanism uses two PR-Y parts - No 1 is a special 5 hole strip bent into a U, while No 3 is a special 4 hole straight strip. Construction of the mechanism should be clear from the photograph. No 2 is a 4 hole collar (as in the Meccano version) and No 4 is a short coupling (essentially replacing the boss of the Meccano small fork piece). Patrick is happy to lend any member the special jigs he has made to facilitate the manufacture of PR-Y parts 1 and 3. The strips are first cut from suitable steel (Patrick uses steel banding) and the holes are then drilled using the jigs. Part 1 is then bent into a U using another jig. (Replica brass parts are available from Dave Doddrell).